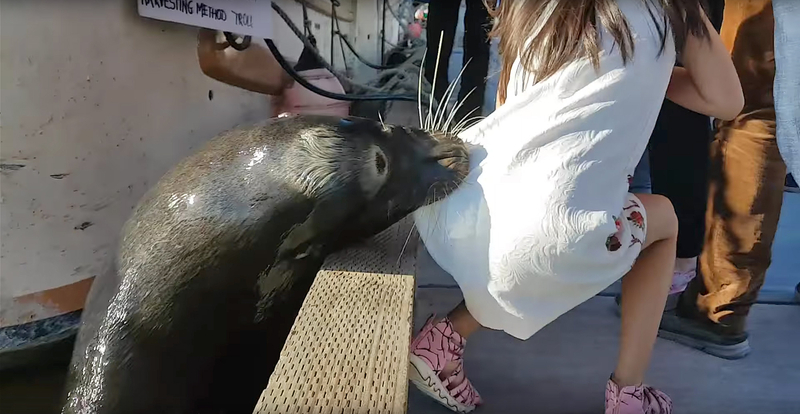 In the video, which has now gone viral with more than 2.2 million views, the sea lion can be seen near the Steveston Fisherman’s Wharf in Canada as a group of people throw bits of food to the animal and comment on how large it is. Then a young girl leans over the edge of the wharf to get a closer look and the sea lion pokes his head up to get closer to her. She then sits down, facing away from animal as it jumps up, grabbing the back of her dress and pulling her into the water as onlookers scream in horror. A man, believed to be the girl’s family member, quickly jumps into the water to rescue her, and he lifts her out of the water as people reach out to help. The girl and her family quickly leave the scene as a man can be heard asking her rescuer if he’s all right. Michael Fujiwara, who captured the dramatic footage, told CBC News that the girl’s family “were just in shock” over the terrifying incident. “They were pretty shaken up,” he said. Andrew Trites, director of the Marine Mammal Research Unit at the University of British Columbia, told CBC that the sea lion looked like it was used to having people feed it.